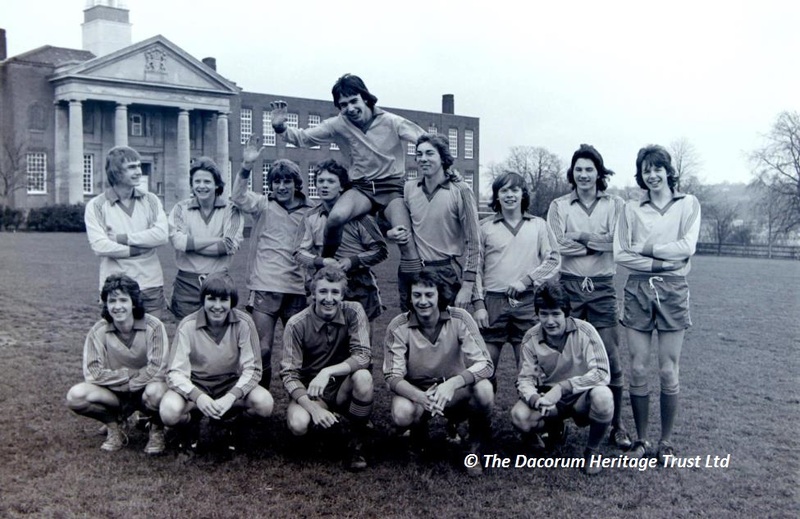 Saving the 70s- World of Sport | The Dacorum Heritage Trust Ltd. The 1972 Munich Olympics were overshadowed by the terrorist massacre of 11 Israeli athletes. Saturday afternoon would not have been complete without watching Dickie Davies presenting World of Sport. George Best and Kevin Keegan reigned supreme on the football field and were worshipped by many a female admirer. Cassius Clay (aka Mohammed Ali) won the World Heavyweight Championship in 1974 and 1978, whilst Henry Cooper was a home-grown hero – as was Barry Sheen. James Hunt won the F1 Championship in 1976. Virginia Wade won Wimbledon in 1977. Red Rum won his third Grand National. 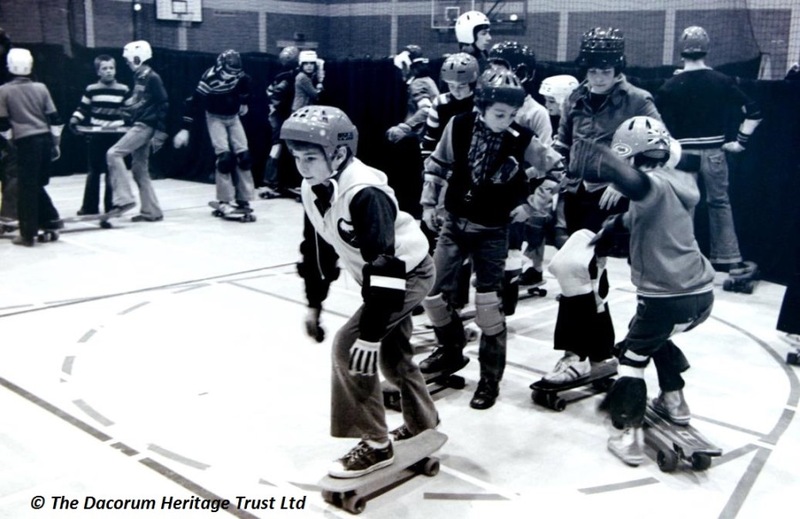 The scourge of skateboarders on the street prompted Dacorum Council to try getting skateboarders into sports halls and playgrounds. This ‘teach in’ attracted dozens of youngsters to a local sports hall. The happy lads of Hemel Hempstead School’s first soccer team. The unbeaten under 19s qualified to represent Hertfordshire in the English Schools’ FA Cup competition. The school also doubled as the Tring Town youth team. Hemel Football Club was part of a team of 73 sportsmen and officials who travelled to Hemel Hempstead’s twin town Neu Isenburg. The party took on their German hosts at football, swimming, shooting, volleyball,basketball and judo. Honours were shared at the end of the competitions. May 11th 1973. The ‘ice–breaking’ ceremony at Churchill swimming pool in Hemel Hempstead was officially carried out by Bob Bryant and Mick Workmen. 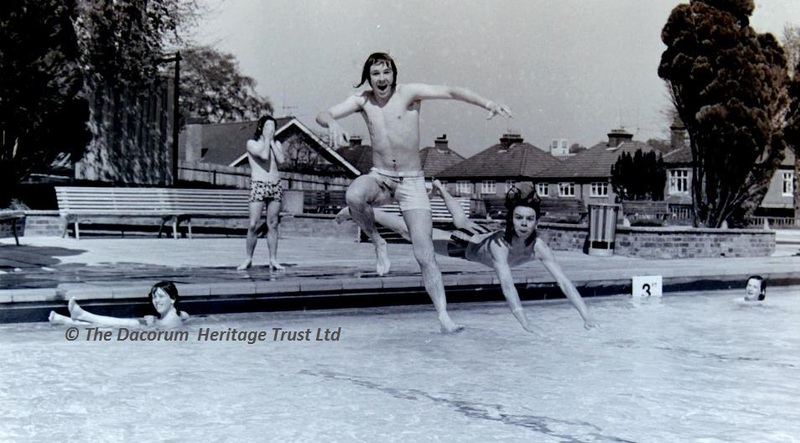 They were the first swimmers to use the pool that year when it opened a little later than usual, as a result of building work on the new indoor pool. ‘Ice breaking’ ceremony at Churchill Swimming Pool, 1973. 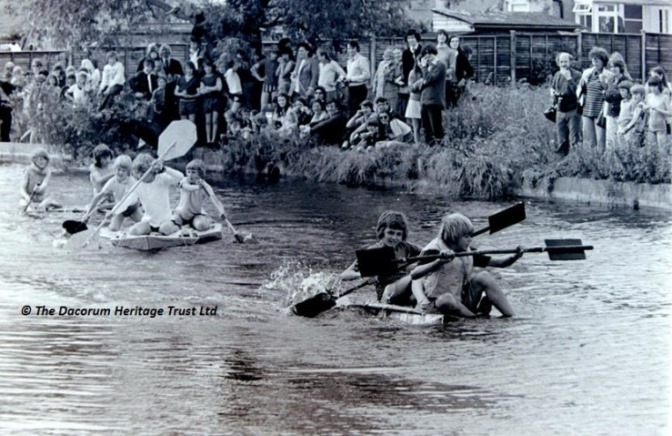 Paddling furiously along the canal at Boxmoor are a number of enthusiastic Scouts taking part in the 1974 annual raft race. Let us know what you remember of the 1970s.